Post-traumatic stress disorder continues to wreak havoc on the lives of veterans, but a new study suggests yoga could provide relief. 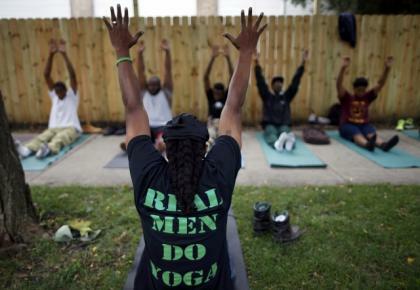 The Center for Investigating Healthy Minds at the Waisman Center of the University of Wisconsin-Madison measured the effectiveness of Sudarshan Kriya Yoga on 21 soldiers for reducing hyper-arousal associated with PTSD. Those who received the one-week training in yogic breathing showed lower anxiety, reduced respiration rates and fewer PTSD symptoms. "This was a preliminary attempt to begin to gather some information on whether this practice of yogic breathing actually reduces symptoms of PTSD," Richard J. Davidson, founder of CIHM and one of the authors of the study, said in a press release. "Secondly, we wanted to find out whether the reduction in symptoms was associated with biological measures that may be important in hyper-arousal." Sudarshan Kriya Yoga is a practice of controlled breathing that directly affects the autonomic nervous system. The breathing technique has proven to be effective in helping tsunami survivors with PTSD, prompting researchers to test it on vets. More than 20 percent of veterans returning from the wars in Iraq and Afghanistan have post-traumatic stress disorder, according to a 2012 report by RAND Corp. Symptoms of PTSD disrupt lives with nightmares, flashbacks, heightened anxiety, and personality changes. Hyper-arousal, the hallmark of PTSD, is an aspect of the autonomic nervous system that scientists believe may be behind the "jumpy" feeling that lies at the core of most PTSD symptoms. This anxiety disorder affects some people after seeing or living through a dangerous event. In these circumstances, fear activates the "fight-or-flight" response, triggering changes in body chemistry that increase stress hormones, cortisol, norepinephrine and adrenaline. In the moment of danger, this healthy reaction can protect a person from harm, but in people with PTSD, this reaction is changed or damaged. Vets with PTSD may feel stressed or frightened long after the danger has passed. Davidson would like to expand the study by including more participants, with the end goal of enabling physicians to prescribe individualized treatment based on a patient's cognitive and emotional style. "It's important to stress that this is a very small preliminary study, but the results are promising. Because some veterans are not interested in talking about their trauma or taking medications, there is a need for new programs that can offer relief from PTSD symptoms," Maria Steenkamp, PhD., assistant professor in the PTSD Research program in the Department of Psychiatry at NYU Langone Medical Center, told CBSNews. "Because there are no negative side effects with this breathing technique, this type of program could potentially be helpful to all PTSD survivors, not just vets," she said.